There once was a bunny named Barnaby,Who lived on a hill so high. Easter Day was his favorite time,And pretty Easter eggs he loved to dye. ​Than delivered the easter baskets, as fast as his legs could fly. And all the girls and boys though Barnaby Bunny, was really a very special guy! 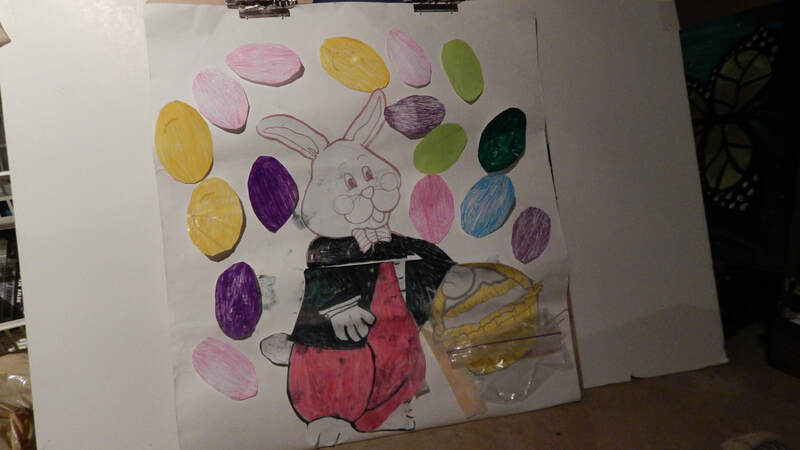 I made this story board and gave five children an egg and each time we read this story the children got a change to put the color egg we would call out into the basket attached to the bunny. The children had such fun reading the story and putting the eggs in the basket. There are to ways you can do this one is to put a magnetic strip on the back of each egg and have each child put an egg in the basket or you can have them but them in his basket like I did with a plastic sandwich bag I taped down. Let me know if you use the story I always love feedback. ​Today I am sharing a post with you on children playing with mud from phoenix-support.com.au/ This is a great article if you want to the value of playing has in mud. parents have asked me what the value of play has at school, as when they sit down for dinner and ask what did you do at school children will say 'play". ​A few years ago, this photo would have made me squeamish. Mud. Yuck. Now, I’m an educator advocating for this kind of messy play. In fact, when I sat together with this little man, smooshing mud and splashing in our puddle, I was just as muddy as he. We were learning, exploring and making memories together. Consider your own childhood memories of play and adventure. Where were you? What were you doing? I bet you weren’t doing a peg puzzle at a table in a small room. You were most likely outdoors, and loving it. So here I am, covered in mud, loving this messy moment and even planning for the next time we might get down on the ground and dirty outdoors. Herein lies my problem. I’ve noticed many other early education environments and educators do not allow this sort of play and I’m wondering why. What happened to early education in this country before the Early Years Learning Framework asked us to reflect upon everything, even those things that have always been done that way? Why does it seem that muddy play was outlawed? Why are some educators still resisting children’s natural gravitation to this sort of play? Are we afraid of the mess? Are we afraid of what parents think? There is no longer any argument around the fact that outside play is vital for child development. Guess what? Nature-deficit is actually a thing! There is even evidence to show that playing in the dirt or mud is beneficial for a child’s immune system. In fact, the National Wildlife Federation in their down to earth article (pun intended), The Dirt on Dirt (2012), cite Dr. Joel Weinstock, director of gastroenterology from Boston, who says, “Children raised in an ultraclean environment are not being exposed to organisms that help them develop appropriate immune regulatory circuits.” The article goes on to argue that getting messy outside benefits the heart, skin, immune system, mental health, and mood, so, for the health of it, and the fun of it, children should be outdoors, barefoot, playing in the dirt. ​​In addition to the health benefits of exposing children to the natural environment, the sensory and developmental benefits are indisputable. Mud in all its glory has infinite learning possibilities. We know that open-ended materials and natural sensory stimulation allows for endless exploration and engages children in lengthy involved play. We know that given a child led pedagogy and a puddle, children will naturally gravitate there given the opportunity. We are aware of good practices such as the Reggio approach which suggests that we value the environment as the third teacher. Our curriculum decisions are now guided by the Early Years Learning Framework which asks us to create opportunities for children to connect with their natural world and environment. How can we do this from a sterile, air-conditioned room with smooth clean surfaces? Mud play seems common sense now doesn’t it? If children in your early education setting are not “allowed” to play in the mud, get dirty or run in the warm summer rain, I would like to invite you, my fellow educators to reflect on your knowledge and experience. We, the reflective practitioner, gather expert knowledge of early education and care as we learn, explore and reflect on our practices within an approved learning framework and a quality standard founded in solid theory and research. It is our duty to educate our families on contemporary learning practices and the benefits, and learning objectives of messy play. As for me, I am going to continue to get mud between my toes and giggle with a child as he revels in the delight and simplicity of mud. I will continue to grow and change as an educator but authentic, natural learning environments and evidence-based practice will always guide my pedagogy and practice. 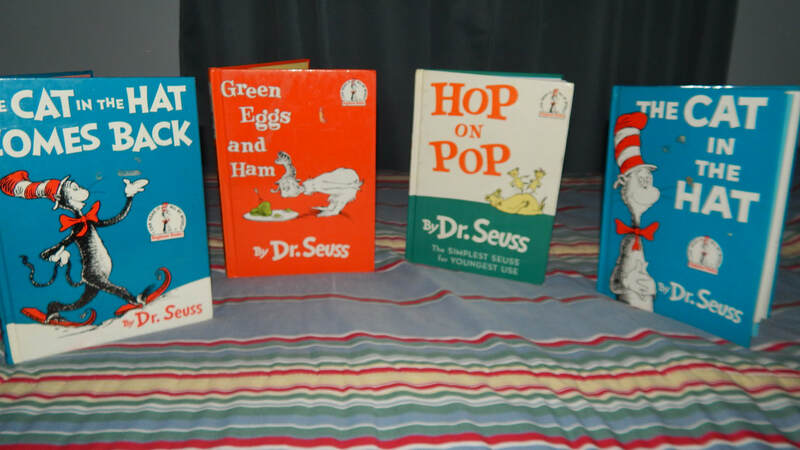 What are some of your favorites and do you share the love of his books with your children? I saw this article from Rebecca Karr, Co-founder at beetbox and had to share it with all you teachers looking to create a happy classroom. Happy Classroom Teaching is tough! That’s why we’ve created 3 easy tips to give you and your students a break. A happy classroom = an effective learning environment. Pass this along to your fellow educators, and help spread the joy of learning! BE PREPAREDIf you’re aiming for a smooth day of learning, it’s important to be as prepared as possible. This means going beyond simply lesson planning. One of the most difficult tasks an educator will face is figuring out how long a lesson or an activity might take. Often times, we overestimate, and are left with extra time and busy bodies. While some students might have breezed through, others might take more time to nail down concepts. Help yourself by having “busy baskets” that finished students can wander off to, and work with independently while you close out the activity. They can contain sensory bottles, puzzles, tracing, or weaving cards and thread, etc. Beetbox is a perfect educational tool to have on deck for situations like these - either for guided learning or independent exploration. BE FLEXIBLEHappy is the teacher that is flexible! It’s easy to get bent out of shape when things in your classroom don’t go according to plan. Instead of fighting to keep your original plan, it’s sometimes best to give your students the best learning experience possible by changing things up. For example, if you had a seated activity planned, and children are struggling to stay on task, accept it and move on by introducing a more hands on or sensory activity to reset. In doing so, you’ll not only give them a break, but yourself one too. Natural materials are an easy way to get a child back on track. Activities like watering a plant, sowing a seed, and anything involving the 5 senses are a great idea. Beetbox is filled with sensory immersive projects. Because we send everything you need, you’ll never be without a hands on activity to have as your plan B. ​So many new (and old) parents have questions about newborn sleep safety. They are constantly trying to figure out the best and safest places for their new baby to sleep. All of these are excellent questions and are common discussions that I have with my patients every day. Not only is it important to create a sleep-friendly environment that will help your newborn fall asleep fast and stay asleep, but it’s also important that it is done in the safest way possible. And with so many seemingly great options out there, it can sometimes be difficult to choose the right one for you and your baby. So, in this post, we’ll explore and discuss some of the best and safest sleep practices for your newborn and cover some pretty cool new innovations that will help your baby to sleep peacefully at night and help you to sleep better knowing that they are in a safe space. What is Sudden Infant Death Syndrome or SIDs? Let’s start by addressing the elephant in the room…. Many people have heard of the term SIDS or Sudden Infant Death Syndrome, but few have a good idea of what it really is. And quite frankly, that’s because we as a medical community are not quite sure what it is either, or at least what causes it. According to SIDS.org, sudden infant death syndrome is “the sudden death of an infant under one year of age which remains unexplained after a thorough case investigation…” And is a condition that is generally associated with sleep. As the definition implies, the cause of death is unknown, but what we do know is that practicing safe sleep habits for newborns has drastically reduced the incidence of SIDS (by more than 50%!). So, what are those safe sleep practices you ask? Keep reading below to find out . To Co-Sleep or Not to Co-Sleep, That is the Question! Many parents love the idea of snuggling to sleep with their little ones and having them within arm’s reach while they sleep. But many parents have also been counseled NOT to do this. So the question is, is it okay to co-sleep???? And the answer is YES!….. But not in the way you might think (sorry). The type of co-sleeping that is okay is sleeping in the same room (not bed) with your newborn. The American Academy of Pediatrics actually recommends that parents share a bedroom with their infants for at least the first 6 months of their lives, which has also been shown to reduce the risk of SIDS. So Why Not Share The Same Bed? That is a good question and the reason is that infants are at increased risk of things like suffocation, falling off the bed, getting smothered and, you guessed it, sudden infant death syndrome when they share the same bed as their parents. This, however, does not mean that you can’t keep your newborn close to you and even within arms reach while you sleep. There are several doctor approved safe sleep spaces for your newborn that will still allow them to be close by for those middle of the night feeds, diaper changes and snuggle sessions. Rule #1: Always put your baby on their back to sleep, this has been shown to significantly reduce the risk of sudden infant death syndrome. Rule #2: Be sure to clear the bed of any blankets, stuffed animals, pillows or other soft and plushy things as these can be suffocation hazards. Rule #3: Make sure your baby’s sleep surface is nice and firm. You should avoid soft plushy mattresses or allowing your baby to fall asleep on soft surfaces such as the sofa or armchair. So there are many options out there for places for your little one to sleep, but all are not created equal. And there are some options that are safer than others. Here, we’ll cover some of the doctor recommended and parent approved places for baby to sleep. Always a great option! Bassinets are small cradles that act as portable sleep spaces for babies that are easily accessible with shallow mattresses and low sidings. Bedside bassinets also called beside sleepers, are bassinets that come with equipment that allows you to attach the bassinette to your bed. This gives you the best of both worlds! You have your baby right at your fingertips while also maintaining a safe sleep environment. This is a classic and a great safe option for baby to sleep in. Cribs have been around since the beginning of time (well maybe not quite). But since then have undergone major upgrades in terms of safety. So, while those antique cribs that have been passed down from generation to generation might be great and hold a lot of sentimental value, just make sure they check the boxes on the safety checklist. Also, be sure not to use crib bumpers as they increase the risk of suffocation. This seems to be a favorite with many of my families and is a super convenient place for baby to sleep. It’s a large bassinette that’s portable and works double duty as somewhere for your baby sleep and play! Many of them also come with modifications such as bassinet inserts or changing table inserts, really giving you options for maximal utilization of the space. And if you’re looking for a safe and cost-effective place to lay your little one to sleep, this is definitely the way to go, generally coming in at about ¼ to ½ the price of your average crib. Now, this is the Mercedes Benz of baby sleepers (with the price tag to match). If you haven’t heard of the Snoo, it is the magical baby bassinette that literally responds to your baby’s cries and gently rocks them back to sleep. This bassinet reportedly responds to your baby’s cry but producing a white noise sound and rocks them at different speeds based on how upset they are. If that isn’t cool enough, it also comes with an app that lets you see what’s happening with your baby and lets you control the functions. And it comes with an attached swaddle that keeps your baby nice and securely positioned in the middle of the bassinette. No one sleep space in this post is better than the other. Choose the one that works best for you and your newborn. What matters most is that you follow the safe sleep recommendations for your newborn to ensure many nights of peaceful and safe sleep. Looking for some good home do it yourself tips check out ​https://theoldsummershome.com/diy-mop-broom-holder/ I found some great tips to try at theoldsummershome.com check it out and let me know what you think. Getting your Toddler to stay in bed...or to nap at all! We parents all know that the world of toddlers is extremely complex! Their little minds are full of learning new things all the time. They are truly amazing. They have to literally learn how to do everything, and they are good at it! Toddlers do not however, come with an instruction manual. They do a lot of things that we parents simply do not understand. For example, why do they keep getting out of bed 500 times!! How do we keep them in bed so that our little angels can get some beauty sleep? Aside from keeping them in bed, how do we even get them to nap at all? How do you keep your toddler in their bed? This is a tricky one that a lot of parents would really like to know the answer to. Our toddlers need sleep! They are so busy during their days, and are constantly on the go, so they need to recharge. We know what is best for them, but a toddler is too young to always know the same thing for themselves. So, how are we supposed to help them get a good night’s sleep when they keep getting out of bed? One method that you can try is calmly walking them back to bed, each and every time they get out of bed. Fair warning, this is going to be exhausting! This is a way that your toddler will start to underhand that they are supposed to be in their bed. Refrain from raising your voice at them. Just calmly walk them back into their room and tuck them back into bed. You will have to stick to your guns, and keep doing this. Consistency will be they with your toddler. If you create a routine where every time they get tout of bed, you walk them back to their room and get them back into their own bed, then they will catch on to the routine. This will not be perfect right off the bat. Expect your toddler to feel upset when you put them back to bed and leave the room. Just remind yourself that "this too shall pass". Another method you can try is coming up with a system or bargaining tool that works for you and your toddler. For example, you can tell your toddler that if they stay in bed all night, they can leave their bedroom door open. Otherwise, the door has to be closed so that they stay in bed. Or you could tell them that if they stay in bed, then they can have xyz. You will come up with what works for you and your beautiful little one. And so after you have conquered getting your toddler to stay in bed all night, it’s off to the next battle. How to get them to nap? Some toddlers nap rally well and some need a little extra sleep training for this. How do we sleep train to get your toddler to nap? This is another aspect of toddler life that can be a mystery. Some toddlers nap very well and others find it more challenging to take a break from their busy day to take a snooze. To the parents whose toddler naps well, that's amazing! Keep up the good work. To the parents of the toddler that is not napping well, I am going to share some tips to hopefully help your little one along in this area. One method that you can try is doing a mini nighttime routine with your toddler. Whatever it is that you do to signal bed time for your child at night, repeat a mini version of it for nap time. For example, at night time, you might give your child a bath, get them some milk and a snack and then read a book. Your child knows that it is just about time for bed because they know this routine that you do with them every night. So for nap time during the day, you can do a smaller version of this to signal sleepy time for your child. You might get them milk and a snack, read a book and then take them up to their room. Make sure their room has a cozy sleepy atmosphere. Close the blinds put on their lullaby music and make it soothing in their room. Your toddler will soon realize that this is sleep time and they are supposed to sleep. If you stay consistent with this, your child will eventually fall into this pattern and nap better for you. The key is to stay consistent and build a routine that your child can recognize. Another method you can try, is not letting your toddler get overtired, a lot of kids get relaxed and sleepier after they eat their lunch. Look for their sleep cues. Do they start rubbing their eyes? Or getting a tad fussy? You will know what your child does that signals that they are getting tired. When you start to notice they are getting tired, start your mini bed time ritual now. If you let them get overtired, they are past the point of being able to relax and fall asleep. Then they tend to cry and scream a little more in their room, because they can't wind down properly to fall asleep. Eternally they will though. In conclusion, just stay consistent with whatever it is that you do as a routine. Our kids need routine and order in their life. That's how they know what comes next in their day. It's also how they know what to expect during their day. If there are no routines, they get confused what they are supposed to be doing. So, just keep working at a routine for your little one and it will all work out! time to get a baby proof list. ​fingers or toys in the socket. 2. Safety Locks: Now the baby is crawling around getting into everything. It is now time to make sure cabinet doors are locked to prevent accidents. 3. Window: Make sure all windows have window guards. Never secure your windows so they do not open as you may need a window for an emergency exit. 4. Gates: Make sure the stairs have a gate up to prevent climbing and falling down the stairs. 5. Doors: Remove doors from old unused appliances such as refrigerators and freezers, coolers and trunks securely because these things can become intriguing hiding places for young children. 6. Pool: If there is a pool or a wading pool outside make sure children are not left alone. Make sure the pool is fenced so children can’t enter alone in and the wading pool should be empty when not in use. I am happy to introduce you to Craig Smith a musician who has taught children how to play guitar giving us his thoughts on music and children. ​1. What is the youngest age you have taught? ​I think the youngest I've had was a 6 year old little girl. It was a bit of a challenge, but she was enthusiastic and her Father played Guitar too, so that helped. 2. Do your students learn to play music easily? I think generally that children do well with Music. Adults have a tendency to overcomplicate things. Children are a blank slate. Kids that start reading music between ages 8-10 often learn it like a second language and with little difficulty. 3. Do you find the younger children harder to teach than the older ones? Certainly below the age of 8 it can be more difficult. That being said, the best student I've ever had was a 10 year old boy who has grown into a world-class professional musician. At 28, he now tours in various bands, teaches lessons himself, and has several worldwide music and video releases to his name. 4. What is the hardest music lesson you had to teach? 5. What advice do you have (to parents?) getting their children ready for their first music class? Don't force it. Just because you or your spouse have a love for music, it doesn't necessarily mean your child will take to it. Often times parents will force children to take lessons for all of the wrong reasons. Child #1 - Was involved in Karate, Soccer and a few other after-school programs. Child #2 - Was more introverted and was really only interested in playing the guitar. Child #2 excelled at music because (she) didn't have the distractions of too many activities. When you spread a child's often limited after-school time between too many activities, much like everything in life, they will never really get good at any one particular thing. ​Craig Smith is a Professional Guitarist, Writer and Blogger in Sanford, Florida. After teaching and performing for over 25 years he started h as an online outlet for his writing passion. An Educator at heart, Craig loves to teach people how to play Guitar and Blog.When he’s not playing Guitar, Skateboarding or arguing with you about why Vinyl Records sound better than CDs, you may find him by the pool with his wife Celeste, 4 Chihuahuas and a drink.